The clock is about to strike the happiest of hours and it has you dreaming of finding the best cocktail spots in Delray Beach. 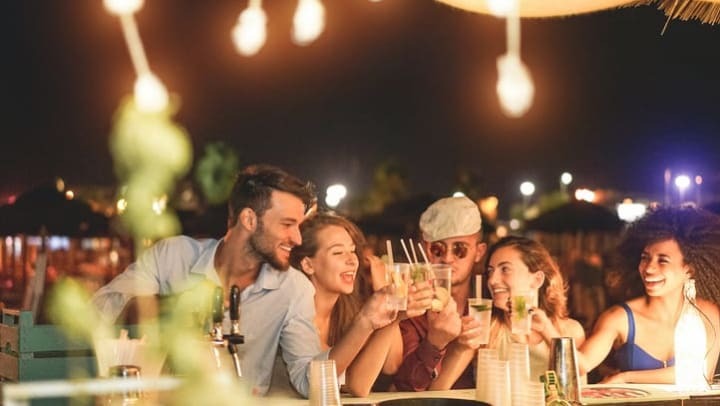 Whether you want to meet co-workers for happy hour or spend an evening under the stars tasting finely crafted cocktails with your date, Delray Beach offers a wide selection of restaurants and bars that specialize in unique beverages you won’t want to forget the next day. Flavorful cocktails, frozen sangria served in ICEE cups, and rum-focused menus can be found at these local hot spots. Cheers! We’re not the only ones who recognize Death or Glory as one of the best cocktail spots in Delray Beach. The Spirited Awards named Death or Glory among their Top 10 Best New American Cocktail Bars for 2018. This local watering hole focuses on paying homage to the rum runners of 1920s Florida with a rum-focused menu. Within the walls of Death or Glory, which makes its home in the historic Falcon House, you’ll be able to imbibe classic and signature cocktails under a canopied outdoor bar. Try signature cocktails like the Samurai Cop, Shot Through the Heart, and the Silver Lining. Buddha Sky Bar takes root in Chinese and Japanese cuisine influences and Asian design concepts in a discrete third-floor location. Overlook Atlantic Avenue in Delray Beach as you indulge in apps from the open sushi bar or dim sum from the delightful menu. Sit under the stars in the glass-roofed arboretum while you try out The Last Samurai, a tasty concoction featuring sake and cucumber. Buddha Sky Bar uses only the freshest ingredients and natural flavors to create enviable craft cocktails shared in a zen atmosphere. The work of local artists graces the walls of Dada, which boasts a cool location in one of the oldest historic homes in Delray Beach. From live art made of succulents and vines to eclectic decor mixed throughout the herb garden with twinkly lights, you’ll come for the cocktails and stay for the atmosphere at Dada. Dada features live entertainment every night including open mic, live bands, and comedians. As for the cocktails, you’ll indulge in beverages named for your favorite artists, including the Salvador Dali, which features Tito’s Vodka, St. Germaine, cucumber, and citrus. This not-so-secret neighborhood cocktail bar comes disguised as a local general store. This unique nightlife concept screams eclectic all the way. The interior is decorated in retro themes and boasts an original Ms. Pac-Man video game. The bar displays fresh produce on display in a market-style showing customers the freshness of the cocktail ingredients. Enjoy complimentary popcorn as you wait for your craft cocktail, the O.G. Hillbilly Martini, to arrive. Or, try their twist on the margarita or frozen sangria-- it’s served in an ICEE cup! For more hot tips on the Delray Beach area, head to our Delray Station Blog.